One million narcissus coloring the road to "Nemophila"
Gorgeous spring comes to the state-run Hitachi Seaside Park. In this most busy season of the year, you can come across beautiful flower scenery wherever you walk in the park. From the west exit on the way to the desired "Miharashi hill" area is the "Narcissus Garden". Under the pine forest on a vast site of about 1 ha, white and yellow narcissus, flowering peaches, etc. are blooming, and spectacular sights are spreading. The appearance of about 550 varieties of 1 million narcissus flowers blooms, which makes it easier for walkers. Marvel at the carpet of "Nemophila" that blends into the sky! The nemophile carpet that blends into the sky attracts the world! The place where the tourists rushed out aiming for the first ride is "Miharashi hill" on the north side of the park. This hill is a spot that is attracting attention not only in Japan but also overseas. As you move forward, a blue world that blends into the sky appears behind the yellow of rapeseed flowers. 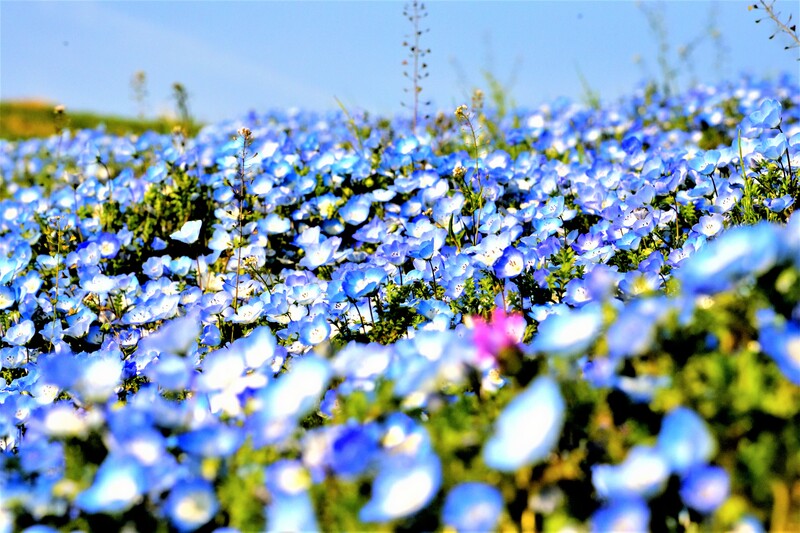 About 4.5 million blue flowers, “Nemophila,” are usually seen from the end of April to the beginning of May. The "Blue Flower Carpet" is a specialty of Hitachi Beach Park. Many tourists visit in the Golden Week. Nemophila, also known as Ruri karakarasu, is said to be strong and long-lived. The flowers are so small that the whole hill looks like a blue carpet. A fantastic nemophila harmony familiar as a spring landscape of the state-owned Hitachi Seaside Park. 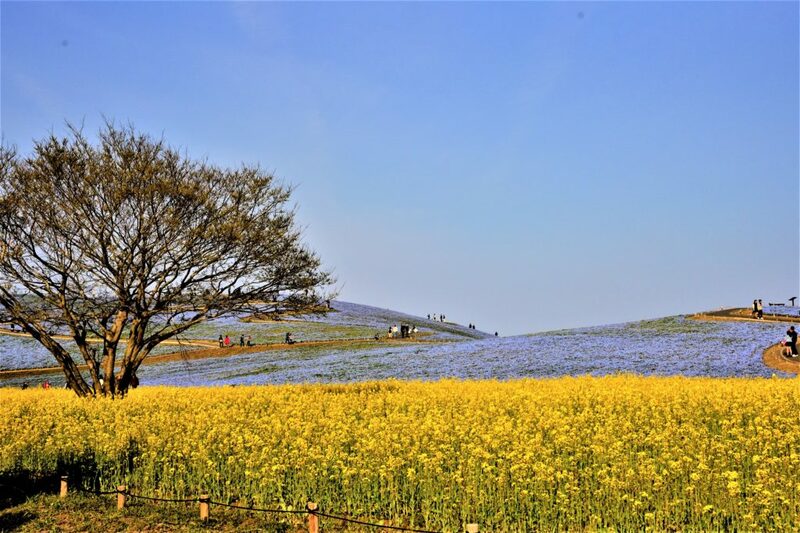 There are 4.5 million nemophila flowers on one side (approximately 3.5 ha) of the huge "Miharashi Hill"! The nemophila field that you can see in the blue sky on the hill is a superb view. The 360-degree, overlooked blue world is as if you were taking a walk off the ground in the air. One of Japan's largest panoramic views of Japan with lovely nemophila flowers, blue sky and the sea is also expressed as "a great blue landscape" and "a hill connected to the sky". And healed and entertained many people's eyes and hearts. We can not but be moved by the dreamy scenery. The blue world "the sea that exists only in Japan"
It has a reputation of being "a sea that only exists in Japan" among foreign countries, and many tourists from overseas visit. It is understandable that it is called "Baby blue eyes" in English from such a lovely blooming. By the way, Nemophila flower language seems to have "Nice", "Forgive you", "Fresh mind", "Success everywhere" etc. Spring "flower relay" to narcissus, tulips and Nemophila. Let's get out of the noise of the city and be caught in the blue sky, the sea and Nemophila.